Versatile, standards-based IP Intercom and PA device with contact closure inputs and relay output. 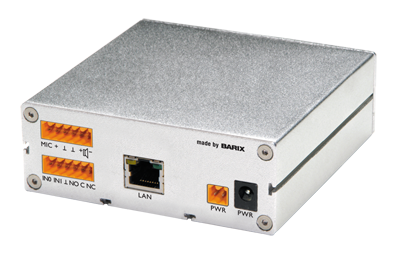 The Barix Annuncicom 100 is a versatile IP Intercom and PA device, capable of full duplex (bidirectional)streaming of uncompressed audio formats, such as PCM, u-law, or a-law, or half-duplex encoding or decoding of MP3 streams.. With its two contact closure inputs and built-in relay, the Annuncicom 100 provides the necessary I/O for push to call and door opener functionality. A built-in speaker output and microphone amplifier allow direct connection of microphone and speaker. Line level inputs and outputs are also available.